Police today arrested two persons for allegedly providing shelter to the owners of '1-Above' pub who were booked after a fire at their establishment claimed 14 lives on Friday. MUMBAI: Police today arrested two persons for allegedly providing shelter to the owners of '1-Above' pub who were booked after a fire at their establishment claimed 14 lives on Friday. Lookout notices were issued against the Sanghvi brothers yesterday. Their uncle Rakesh Sanghvi and cousin Aditya Sanghvi were arrested today, senior police inspector, Byculla, Avinash Shingthe said. A search was on for their another relative, Mahendra Sanghvi, he said, without divulging more details. The three relatives, all residents of the Mazgaon area in Byculla, were booked under IPC section 216 (harbouring an offender who has escaped from custody or whose apprehension has been ordered), another police official said. The accused pub owners were yet to be arrested, another police official said, adding that efforts were underway to trace them. Meanwhile, the NM Joshi Marg police probing the fire incident recorded the statements of nearly 27 eye-witnesses. "So far, we have recorded statements of about 27 eye-witnesses. We are searching for more witnesses in connection with the incident," a police official said. On Friday, the police had booked the Sanghvi brothers, Manka and others under IPC sections 304 (culpable homicide not amounting to murder), 337 (causing hurt by act endangering life or personal safety of others) and 338 (causing grievous hurt by act endangering life or personal safety of others). However, the pub had in a statement claimed that it had all the necessary approvals and safety norms in place. It had also blamed Mojo's Bistro on the floor below for not having an emergency exit, leading to overcrowding of the escape avenues of '1 Above'. 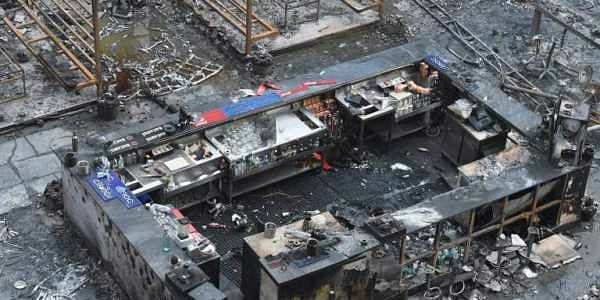 The massive fire that swept through the pub left 14 people dead and 21 injured. Among those killed was Khushbu Bansali, the woman who was celebrating her 29th birthday. Since the pubs are located in the Kamala Mills compound where the alleged illegal extension was constructed, its owners have been named in the FIR, Deputy Commissioner of Police Zone 3 Virendra Mishra had said. In the wake of the fire incident, police yesterday registered three cases against mall and pub owners in the city on charges of illegal construction, officials said.